At Twistfix, we constantly update our already-extensive product portfolio in order to bring the widest possible choice to our customers. 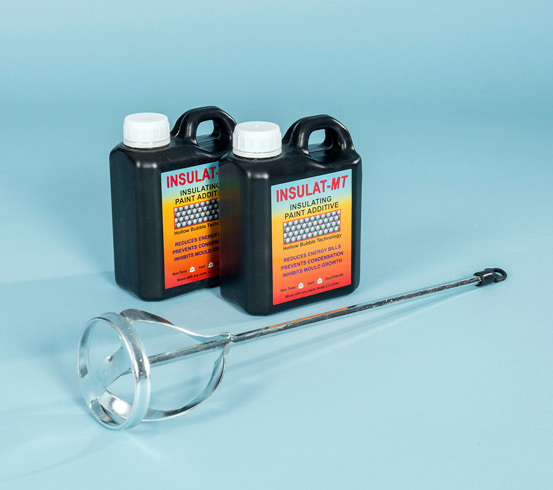 Here we are pleased to introduce our newest product – Insulat-MT Paint Additive – available with an introductory discount of 16%. Insulat-MT Paint Additive is designed to improve the thermal energy efficiency of a structure, saving money and the environment while creating a consistently comfortable temperature within. Mixed simply and quickly into any type and texture of paint, the effective formula creates a reflective barrier that has the dual function of decreasing heat loss during winter and preventing heat gain in summer. Insulat-MT has the added benefit of dampening ambient noise. This highly-effective insulating paint is supplied in powder form. The powder is made up of coated ceramic microspheres which, with a vacuum at their centre, provide the insulating effect - heat can not pass by conduction through a vacuum. A thermal barrier is thus produced which dramatically lowers energy costs, prevents damaging condensation and inhibits the growth of unsightly and unhealthy mould. Using Insulat-MT Paint additive couldn’t be easier, simply stir a full 200g container thoroughly into 2.5L of paint before applying as normal with a roller or brush. Once dry, the non-toxic formula can then be overpainted without any deterioration in its performance. Insulat-MT can also be used for “warm to the touch” areas of metal such as seating and banisters or added to roof coatings or masonry paint that will, when applied, reflect the sun’s energy away from the envelope of the building. Order now to take advantage of our fantastic 16% discount, which brings the price of each 200g container down to just £10.95+VAT. Call our team on 0845 123 6006 or email sales@twistfix.co.uk to find out more about this innovative paint additive or for information on any of range of damp proofing, masonry repair, basement waterproofing and other construction and renovation products.